This letter was written by 18 year-old John W. Scott (1844-1921), the son of Samuel S. Scott (1820-1881) and Charlotte Gibbs (1822-18xx) of Gratis, Preble County, Ohio. 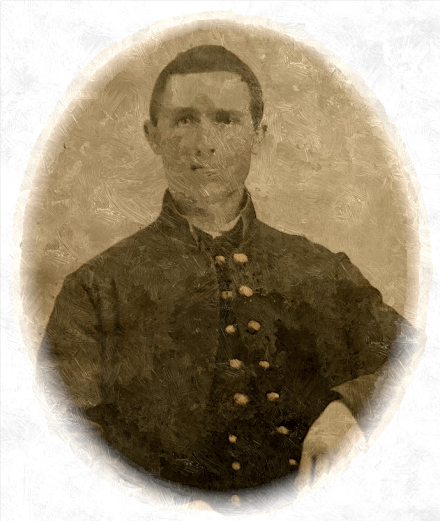 John enlisted in 22 August 1862 for three years in the 112th Ohio Infantry, but when that regiment did not raise the required number of soldiers, he was transferred on the 6th of November into Company B, 63rd Ohio Infantry. After the evacuation of Corinth, the 63rd OVI operated in Northern Alabama, and participated in the battles of Iuka and Corinth in the army of William S. Rosecrans. When Colonel Sprague was promoted to brigadier general, Oscar L. Jackson assumed command of the 63rd Ohio Regiment. During 1863, the 63rd operated mostly in Northern Alabama and Tennessee. In January 1864, most of the men re-enlisted for three years, and the regiment went to Ohio on veteran furlough. In May it joined Sherman’s Atlanta Campaign and shared in all the battles to the end of the campaign. In the autumn, the 63rd took part in Sherman’s March to the Sea. 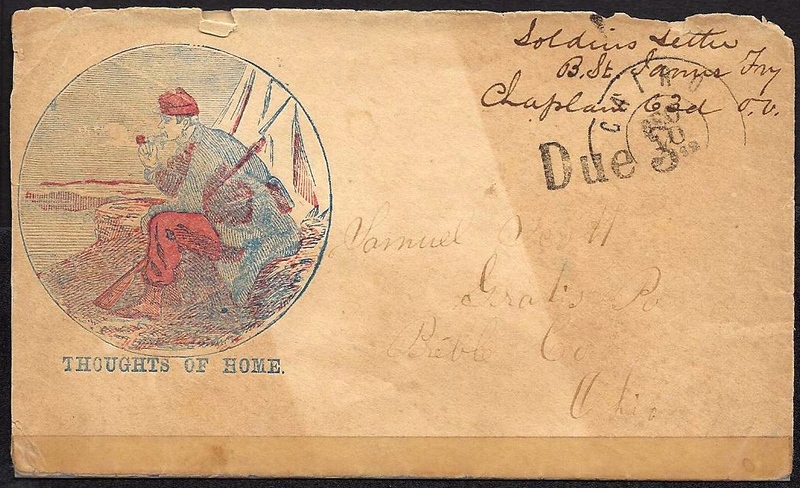 In early 1865, the 63rd participated in the Carolinas Campaign. It took part in the Grand Review of the Armies in Washington, D.C. in May and then went by train to Louisville, Kentucky, where the men mustered out on July 8, 1865. Well Pap, I will write you a few more lines to let you know that I am in the same camp that I was when I wrote to Charley the other day. I was going to write more then but they said the mail was going right away and if I wanted my letter to go, I had better send it then for the maybe the mail would not go out again for a week so I thought I would send it while I had a chance. There was some cavalry men went by here yesterday with 52 Secesh prisoners that they had taken that morning. I don’t know when we will leave here — the Captain said maybe in a couple days and might not for two months. We have a good Captain [Charles E. Brown] & Lieutenant. I expect the captain will be Major or Lieutenant Colonel before long. It is warm here today. There was a little frost last night — first I have seen down here. There is a good deal of rain here. It come in our tent the other night so as we could not lay down without getting wet. The wind blowed so I thought our tent would blow down. There was a few that did. I don’t believe it is worthwhile to send them shirts down here for I am plenty warm and have too much to carry now. You can wear them if they are big enough. I wish you would send some postage stamps for I can’t get any here. Don’t send many at a time if you send them in a letter. When we stopped here you ought to have seen us tear down the fence. Every company tried to get the most. It looked funny to see so many run for rails. I will bring my letter to a close. Write soon. So no more. With love to all. So good bye. I would like to come home and help you kill hogs and eat some of your good apples and good things. Direct your letter by way of Cairo, to follow the Regiment. This entry was posted on Tuesday, October 21st, 2014 at 4:20 am	and posted in Uncategorized. You can follow any responses to this entry through the RSS 2.0 feed. I am a descendant of Thomas Scott, the father of Samuel Scott who lived in Gratis, Preble County, Ohio. A relative of mine discovered your transcription of the 1862 letter of John W. Scott to his father, Samuel. We are very curious about the letter – perhaps how you came across it, and where it is now. We have just begun earnest family research in the last couple years, and just last year discovered the Thomas Scott homestead in Preble county. I do know that Thomas and family migrated to Ohio from New Jersey in 1817 along with other Quakers from the Burlington area. They were part of the Quakers in West Elkton, below Gratis until the late 1820’s when they dissented in favor of the separatist movement. It is interesting to me that although John was raised a Quaker, he served in the civil war. I do not know a lot about the Samuel Scott line and so am pleased to learn more. I will look to see if we might have a photo of John Scott. I do think I have one of Samuel and Charlotte. Thank you for your service to preserve history, and I am thankful to learn more of my family heritage.